Many individuals rely upon modern jacketed hollow point ammunition for personal defense. A loading with a good balance of expansion and penetration exhibits excellent wound potential. But hollow point bullets are not perfect. Some will close up on meeting bone. With the bullet mashed shut the nose cannot fill with material and instigate bullet expansion. Others may expand too quickly, others too slowly. As a young person I began handloading my own ammunition and often used hard cast semi-wadcutter bullets (SWC). 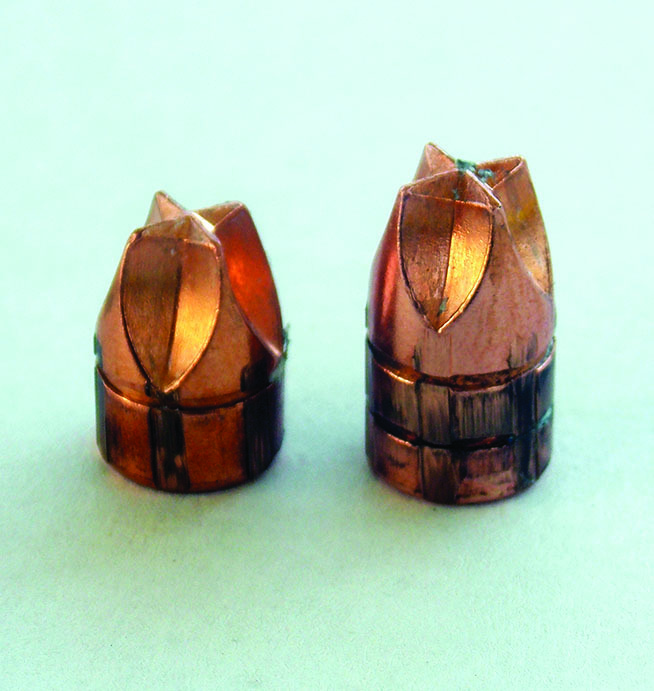 These bullets featured a flat nose and a sharp driving shoulder. The damage these bullets did was much superior to a round nose lead bullet. The flat nose and sharp shoulders cut flesh rather than simply pressing it aside. The Honey Badger bullet nose is quite sharp. Some feel the handgun is simply a projectile launcher and the bullet is what matters most. There has been a great deal of research into wound ballistics. 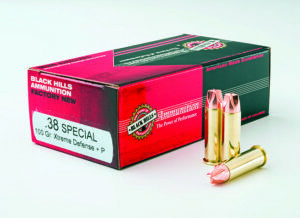 Black Hills Ammunition offers excellent jacketed hollow point loads in the popular calibers. They also offer economical non-expanding bullet loads. The new Honey Badger load is designed to make for good wound ballistics without using a hollow point bullet. 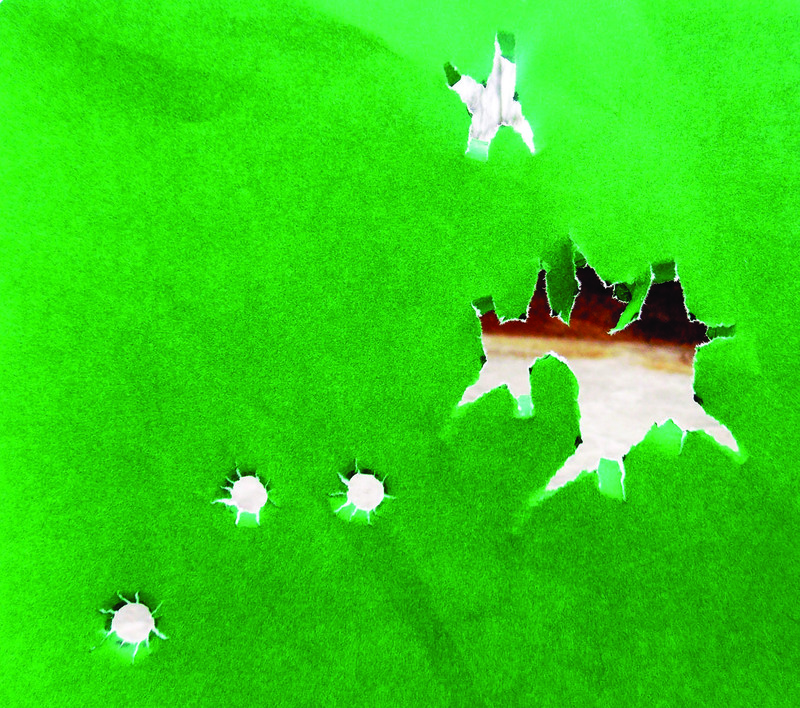 Handgun bullets produce wounds by making holes in the target. Damage must be done to make for blood loss. The body is a pressurized system and when blood is lost blood pressure drops and the body shuts down. The goal of personal defense shooters is to increase the size of this hole in relation to the caliber of the handgun used. Another thing that is desirable in a personal defense bullet is that the bullets track straight to the vital organs without deviation and that penetration is adequate. Note tears in paper target with Honey Badger. Penetration isn’t difficult to design into a bullet and modern hollow points may be designed to expand reliably. The problem is maintaining the proper mix of expansion and penetration. Personal research and experience tells me that when small bore cartridges have performed to a greater degree than expected it is because they have penetrated deeply. When a big cartridge fails it is often because it has not exhibited adequate penetration. The bullet must penetrate heavy clothing or light cover and penetrate and break bones to reach the vital organs. This isn’t something that may be compromised. There is plenty of bearing surface on this all copper bullet for good accuracy. The Honey Badger bullet is a solid copper bullet with cutting flutes machined into the body. The bullets are very precisely machined and while they are designed primarily for wound ballistics they are also very accurate. 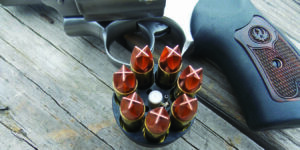 The bullets have a profile that allows good feed reliability in self-loading pistols. Depending on the caliber, the bullets have three or four scallops or flutes machined into the nose. 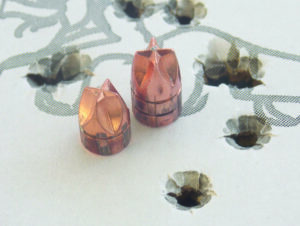 These cut-out sections extend to the bullet’s tip where they are formed into a pointed star like star. 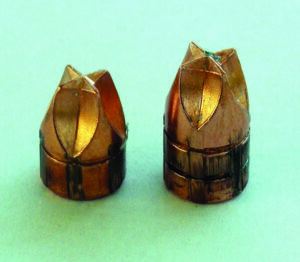 The bullets are sharp―in fact, when loading these bullets in .380 ACP magazines we were careful not to push against the very tip of the nose but to apply pressure to the side of the bullet in loading. I actually picked up a small cut until I learned this simple caution. I have fired these bullets extensively and tested them in water for penetration. While some of my observations may not be scientific, they are useful. When firing full metal jacketed bullets or round nose lead bullets into water the effect on the water jugs I use (six inch wide water jugs) isn’t very dynamic. Firing the Honey Badger loads at a similar velocity creates dynamic disruption. The bullet nose design forces water or tissue outward producing in effect a larger wound that extends past the tissue the bullet is actually touching. 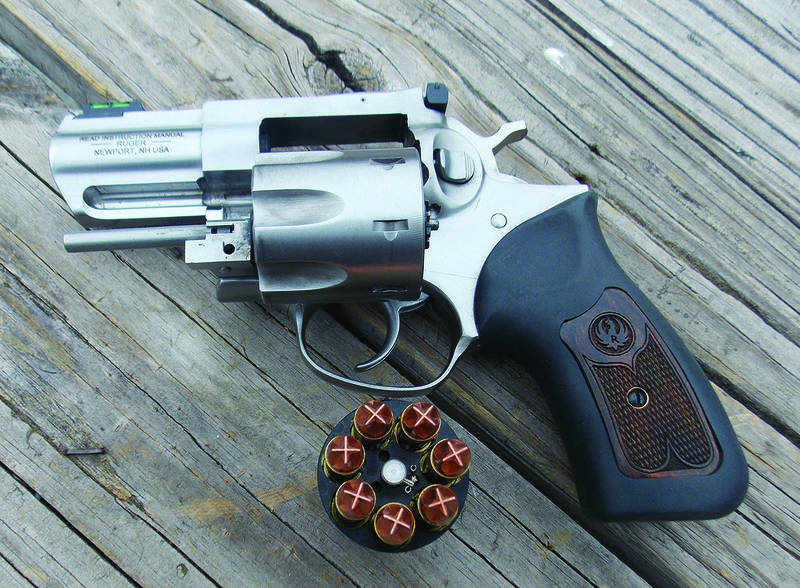 The Ruger GP 100 gave excellent results with the Honey Badger. I would have thought. Gelatin blocks are stable and the wound cavity may be measured. No SWC bullet offers the type of damage the Honey Badger does and round nose or full metal jacketed bullets are far behind. FMJ bullets allow tissue to close up around the wound as the flesh is more pushed aside than cut. The results are impressive with the Honey Badger compared to these loadings. In a day when ridiculous claims are common and many bullets are designed to break up early rather than offer adequate penetration the Honey Badger is a great new loading and an offering that makes a lot of sense for many of us. My personal scenario includes travel in both urban and rural areas. Protection against dangerous animals including feral dogs and the big cats is important. While the Honey Badger meets FBI standards for penetration it is also a load that doesn’t over-penetrate. The flutes act like a kind of air brake in gelatin testing, at least I feel it does. 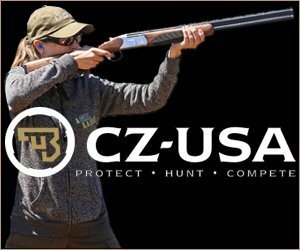 Black Hills Ammunition offers first quality ammunition in every sense of the word. These loads, like other Black Hills Ammunition handgun loads, offer a clean powder burn, good accuracy and modest muzzle signature. I have been able to test most of the Honey Badger loads with good results. Gelatin results with the Honey Badger have been excellent. I have fired the .380 ACP 60-grain in a Rock Island Baby Rock, Springfield 911 and the new Smith & Wesson Shield. Muzzle velocity was 1170 fps in the Baby Rock and a blistering 1190 fps in the Shield. Even the 2.6-inch barrel Springfield exhibited 1151 fps. That is excellent velocity. Yet, like most .380 ACP loads this one features modest recoil. Accuracy is excellent. I was able to strike small objects at 25 yards with these pistols and the Honey Badger loading. Penetration in water was over 15 inches. In a micro hideout .380 this load outstrips the .32 ACP, .32 H & R Magnum, and standard .380 ACP loads with good function and excellent accuracy. I fired the 9mm 125-grain Honey Badger load extensively in my personal Springfield EMP. Velocity is 968 fps. Recoil is very light, qualifying the load for those that are recoil sensitive. Accuracy is excellent. When loaded in speed loaders the Honey Badger isn’t difficult to quickly load. I used this load when testing a modern pistol that would not feed JHP bullets. While a modern pistol with feed problems is rare, there it was. Penetration in water is 18 inches. This is a load for the recoil shy that offers better ballistics than an FMJ loading. I own a Colt Detective Special and a Colt Cobra, both manufactured in 1962. The Honey Badger bullet is an amazing breakthrough in many ways. barrel .357 Magnum revolvers and found it match grade accurate. Penetration is virtually the same as the 9mm load, just a half inch or so less on average. Recently I fired the load in my Colt Police Positive Special with four-inch barrel. I was surprised to see the 100-grain bullet clock 1211 fps over the Competition Electronics Chronograph. 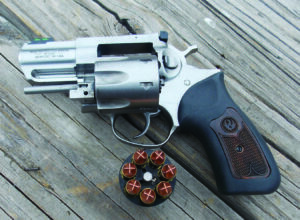 This is a viable loading and it will be my first choice in lighter .38 Special revolvers. The Honey Badger is packaged in 50 round boxes in some calibers and 20 rounds in others. Magnum. For animal defense and close range encounters with feral dogs, the .44 Magnum would make an awesome combination. The 135-grain .45 ACP Honey Badger is also interesting. The .45 ACP, frankly, doesn’t need any help but the small bore cartridges do. I am going to study the .45 ACP more closely in the future. Meanwhile my results with the .380 ACP, 9mm Luger and .38 Special are impressive. As a sidenote there are a few jurisdictions in various people’s republics that prohibit hollow point ammunition in carry guns. The Honey Badger isn’t a JHP. The Honey Badger is a viable loading well worth your study.